An evening of alters and catrinas. Fabrica Aurora, the old textile factory turned art galleries, held a Day of the Dead evening, art walk, music, drink and nibbles. San Miguel turned out in droves. 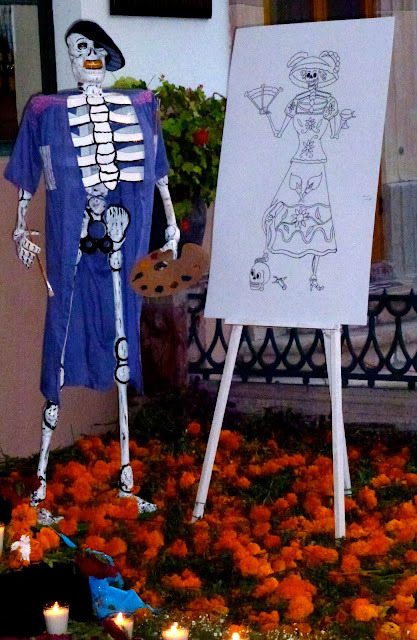 Many in full dress as Catrinas, the place dripped with atmosphere as we nibbled bon bons, sipped wine and thoroughly enjoyed the art and the beautiful atmosphere. 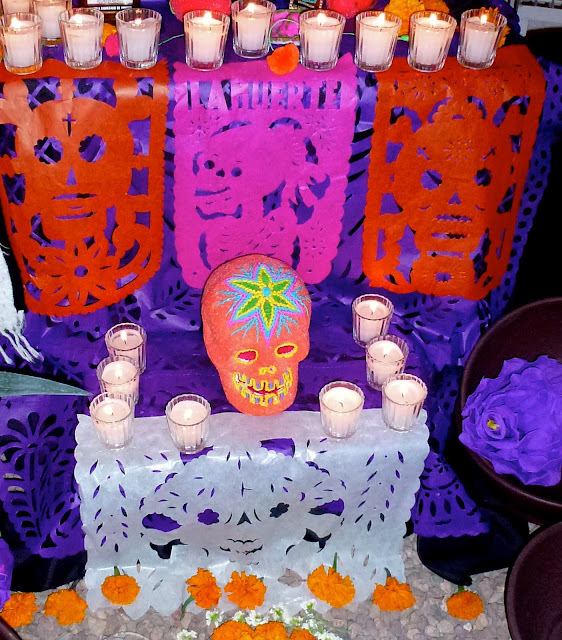 The colours of Day of the Dead are orange and purple, the flowers, marigolds and violetas. As I entered Fabrica tonight the trio was playing music from the nightclub scene in Frida. I felt the magic of this country. 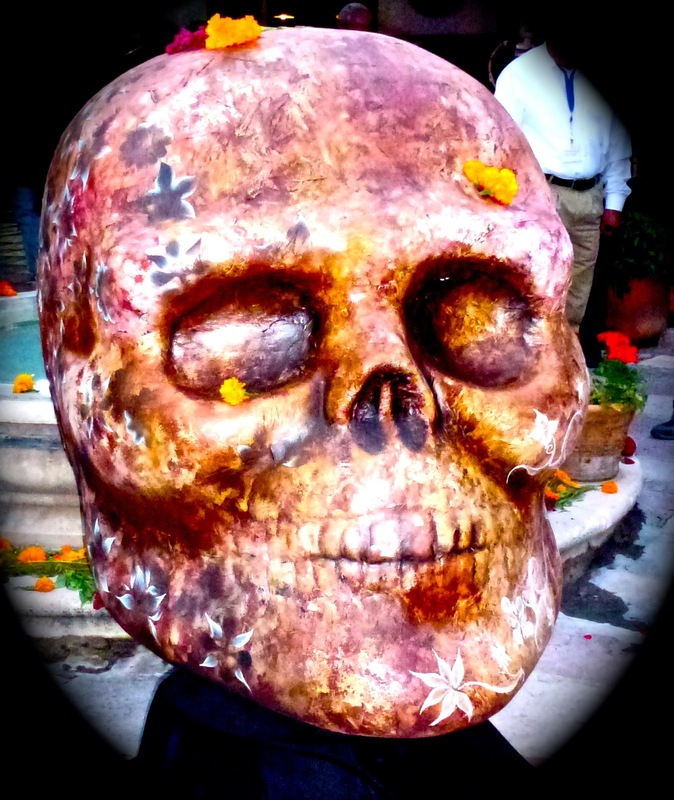 Walking in to the huge foyer, I was greeted with a massive sugar skull, almost as tall as me. 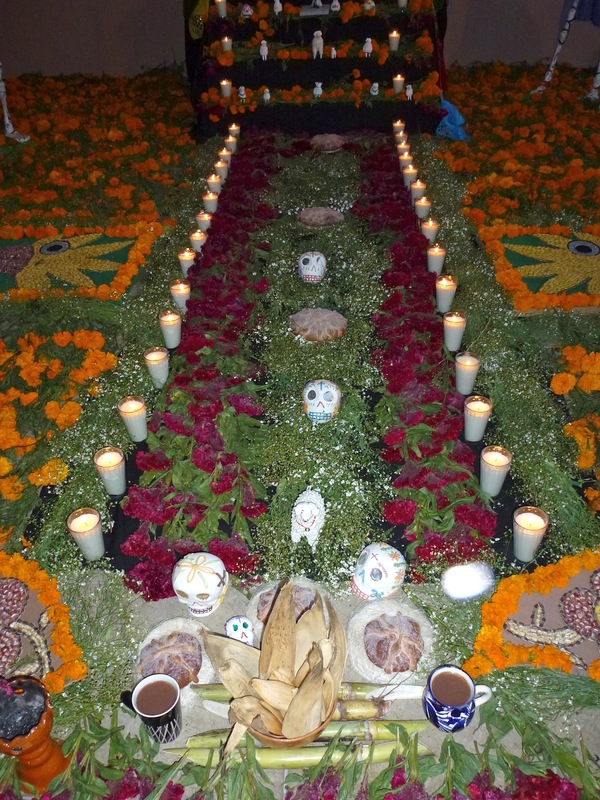 The alter, which filled half the foyer is made with fresh flowers. Huge pots with flowers floating in water. 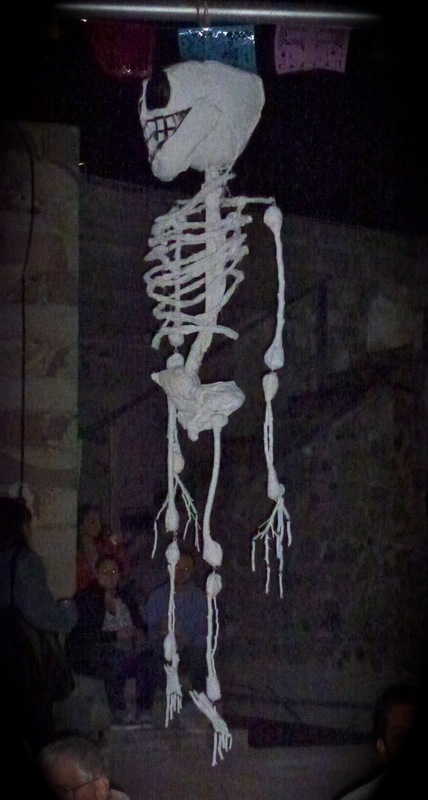 Every gallery had an alter. The trio in the foyer playing wonderful Mexican music. These are the molds paper mache dolls were made from. 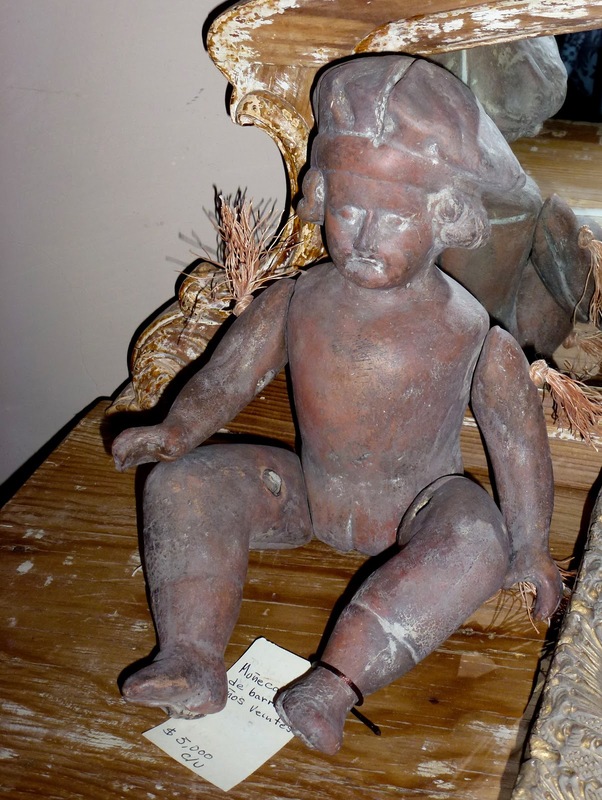 These dolls are still produced, however this particular mold is antique. It would be fun to go in costume. Ah, more mellow music from Old Mexico. I could listen forever. We ended the evening at Don Felix, by now my favorite restaurant in town. Great pictures. 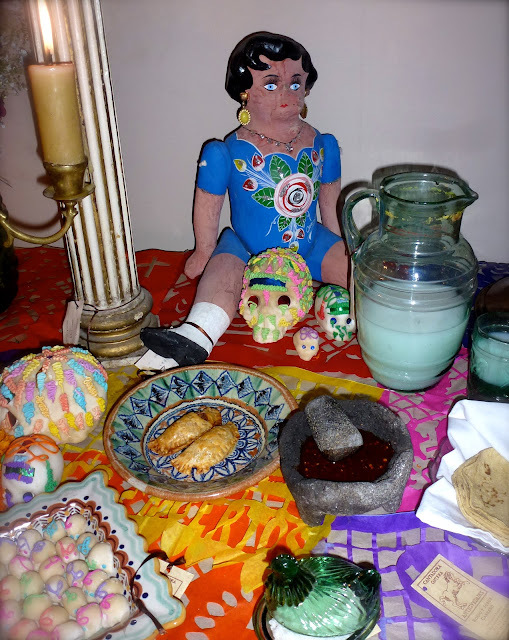 We are having the same celebrations here...as we are so close to Mexico. That is awesome! I love how you celebrate. :) That skull is huge! :)Awesome photos! Loved seeing your pictures, Donna! Fabulous celebrations! Wow, look at all the flowers, beautiful. i do miss san miguel. please have some fajitas for me at ole ole!!! What a wonderful post! Almost feel as if I'm there. Those cut-out paper flags are so compelling. 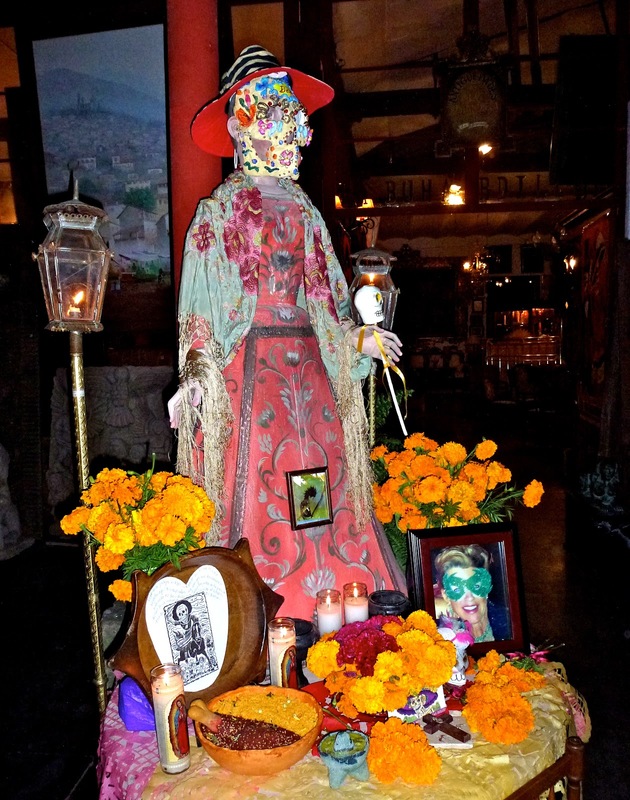 The altars are so beautifully arranged. Near sensory overload! Lovely. Oh my goodness, Donna!! What an event! You have captured the mood and color of it perfectly. I can feel the festive vibes... wonderful job! !